“You’re going to lose at least 15 pounds.” That’s what every friend who has climbed or trekked at high-altitude told me before I left for Nepal. But they didn’t have Phuri Sherpa cooking for them. It’s day eight on our hike to Mount Everest base camp and I haven’t shed a pound. If we’re not trekking or sleeping, we’re eating. The routine goes like this: Every morning we wake up between six or seven with a knock on the door by Phuri, who serves us a high-powered combo of lemon tea mixed with a Tang-like lemon-flavored powder, which we leisurely sip in bed. An hour later, we meet in the lodge dining room where the Sherpas serve us hot porridge followed by French toast or eggs and sausage. At the end of breakfast, one of them presents us with a silver tray of Snickers, Mars, or Toblerone candy bars—a treat to save for later. How can I resist? We hit the trail by 8 or 9 and, by 10 or 11, stop again at a tea house for hot beverage number two. A few hours later, we’ll stop for a hot lunch cooked on the fly, of course, by Phuri and his “kitchen boys” or assistant cooks. When we reach the lodge at around 4 p.m., we’ll have a mid-afternoon tea with popcorn, cookies, and Pringles, followed by dinner at around 7. Last night we dined in candlelight on bean burritos, a beat, carrot, and cucumber salad, white rice, and spicy green beans. Dessert was fresh fruit in light cream. 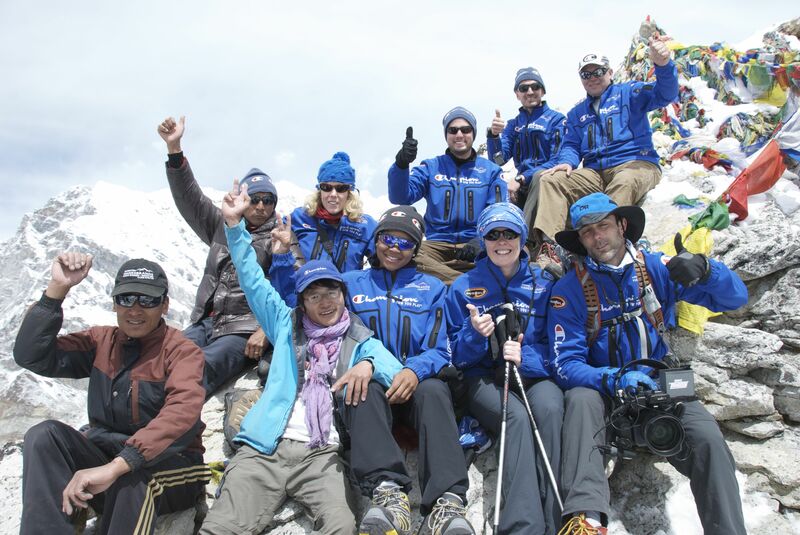 Wally Berg, head of Berg Adventures International, who organized our trek to base camp, estimates that the entire expedition (including Jamie Clarke’s team at base camp) will require a couple thousand pounds of food. That number is staggering. But even more mind-boggling is that every last pound of food was either transported from Costco in Canada or bought in Kathmandu. Then Ang Temba Sherpa and his crew hauled up by the truckload to a town at the end of the road, put it on a helicopter to Lukla, then carried it by foot to our current location, Lobuche, which is 16,000 feet. For Phuri and his team, that means their day starts at 4 a.m. They wake up, start fires, serve tea, make breakfast, then pack their kerosene stoves, pots, pans, utensils, and food into their wicker baskets, and high-tail it to the pre-determined lunch spot, where they make a hot meal from scratch. The same goes for dinner. The other day the Sherpas made us a picnic lunch in a rhododendron forest in view of the famous Tengboche monastery. As Ang Nuru Sherpa served us hot orange drink, Phuri’s assistant kneaded bread dough he had just made from scratch, which Phuri boiled in a pot of oil over a kerosene burner. Another assistant chopped fresh cabbage, while another one washes dishes. They all moved at lightning speed, while the rest of us snoozed on a blue tarp covered with a flowered tablecloth. Just a few minutes after we arrived, our trekking guide, Khari Jang Rai, served us a first course of hot mushroom soup, followed by a plate of boiled cabbage, baked beans, fresh Tibetan fry bread, corn, and an unidentified fried meat that I’ll call Spam. After approximately 26 more meals as full as this one, not to mention candy bar breaks and afternoon tea, I may be the only person who actually gains weight on the way to base camp.